Lavatch’s last Listener was over two years ago with no. 4161 Not a Blocked Grid. This had London’s Congestion Charge as its theme, which had been introduced in 2003 by everyone’s favourite politician, Ken Livingstone. [Ed: not mine!] This week was the last puzzle of 2016, and we had misprints to unravel in all the clues and nine unclued entries to complete. The corrections to misprints would spell out an instruction. 5ac had some bizarre animal shenanigans going on with Monkey seizing dog perhaps is displaying interest in crow (8). 10ac Bell getting hammered with pause being likely (9) was an almost straightforward anagram (‘Bell’ was ‘Bill’) giving PLAUSIBLE. With 15ac’s ‘Latin bear’ URSA and 16ac’s GOATHERDS, the top of the grid started well. A flurry of down entries then got slotted in together with a few more acrosses, including APPETISE at 10ac (see above with ‘chow’ for ‘crow’). The top right came together fairly well, followed by the top left. After about 40 minutes, it looked as though the instruction was going to require us to highlight something. As I expected from Lavatch, there were some fine clues with some entertaining surface readings. My favourite had to be 23ac A lot of edible grain for a chou in pâtisserie? (5), where ‘chou’ had to become ‘thou’ to give French for a thousand, MILLE. My only discomfort was caused by MYRRHY at 38, which the preamble said was in the ODE; it’s not in mine, but is in the OED. Still, Costs of musky reindeer, heady like fragrant substance (6) could hardly be anything else, especially if you changed ‘costs’ to ‘coats’! After about two hours, my grid was complete. The corrections spelt out Highlight thematic quotation in symmetrical form. THE in row 3 was a bit of a help, and it wasn’t long before I had “THE WHEEL IS COME FULL CIRCLE” from King Lear Act V, Scene III. 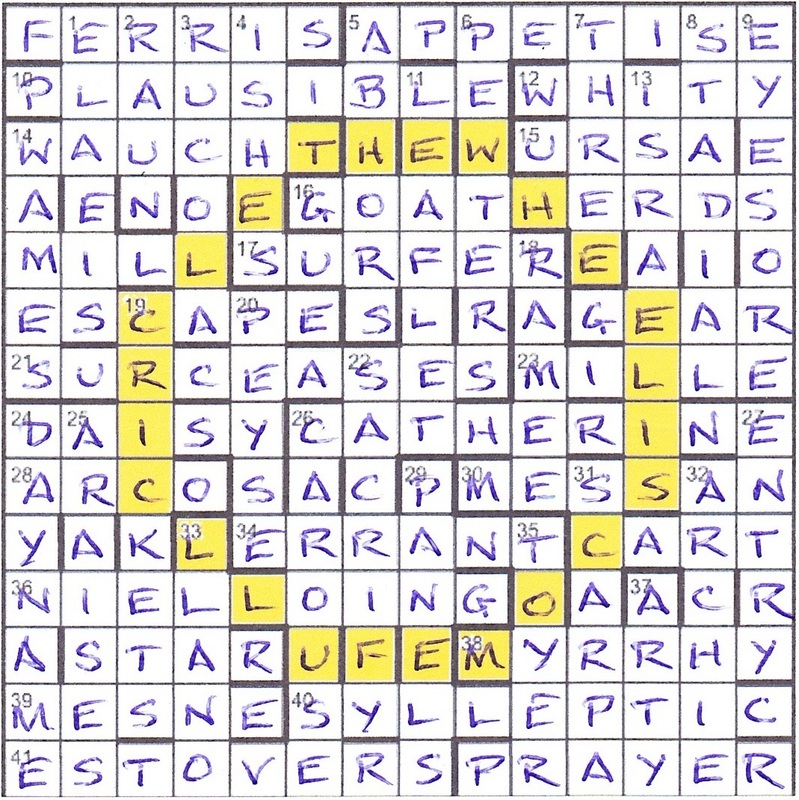 I felt sure I had come across this quotation in a recent crossword, but the only one I could find was Kea’s Independent Weekend puzzle, What Goes Around… way back in June 2005. All the unclued entries were types of wheel: FERRIS, MILL, ESCAPE, GEAR, DAISY, CATHERINE, CART, STAR, PRAYER. I assumed that the proviso about unchecked letters of thematic words was to distinguish GEAR from REAR, which appears in Chambers in the phrase rear-wheel drive. All in all, a nice leisurely end to the year, even if your New Year’s Eve festivities caused somewhat mental fuzziness well into January! [Ed: no sympathy!] Thanks, Lavatch. This entry was posted on 20 January 2017 at 4:00 pm	and is filed under Solving Blogs. Tagged: Lavatch, Round. You can follow any responses to this entry through the RSS 2.0 feed. You can leave a response, or trackback from your own site.